While Donald Trump was responsible for most peaks in the Twitter debate on climate change in recent years, 2018 was different: a scientific report trumped Trump in triggering the most intensive Twitter debate related to climate change. As in previous years, we take a look at the Twitter data our Online Media Monitor (OMM) has gathered over the course of 2018, and describe the events that triggered tweets about climate change, as well as the most important domains that were linked to and the most active accounts in our sample. 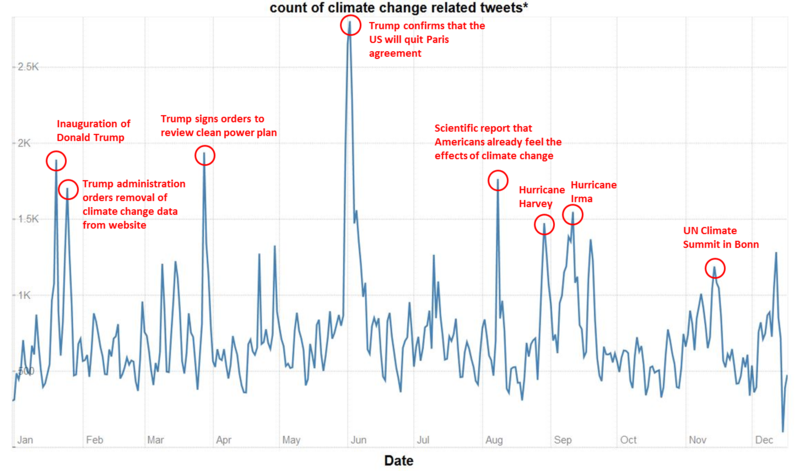 In summary, the number of tweets related to climate change has again risen in the past year. However, our sample does not allow us to examine whether this means that climate change has become a more prominent topic in Twitter communication, or if the number of tweets in total has risen, too. 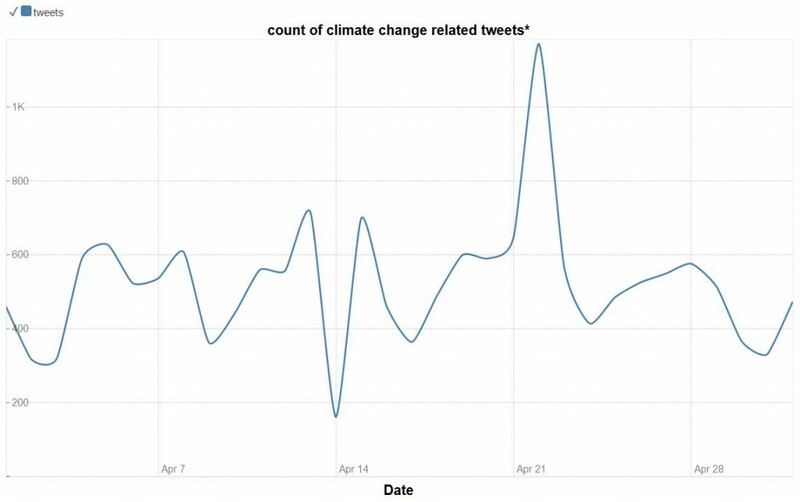 For most of the year, the number of climate change-related tweets per day is astonishingly stable. In the second half of 2018, attention peaks were triggered by political and scientific events, as well as weather phenomena. In September, Hurricane „Florence“ hit the US. The peak of attention manifested on Twitter when scientists’ reports connected the storm to climate change, warning that climate change will probably intensify the frequency and magnitude of hurricanes. The most discussed event on Twitter in 2018 was a scientific one: After the release of the IPCC special report “on the impacts of global warming of 1.5°C above pre-industrial levels” on Oct. 7, the OMM recorded an all-time high of 4196 tweets on one day. 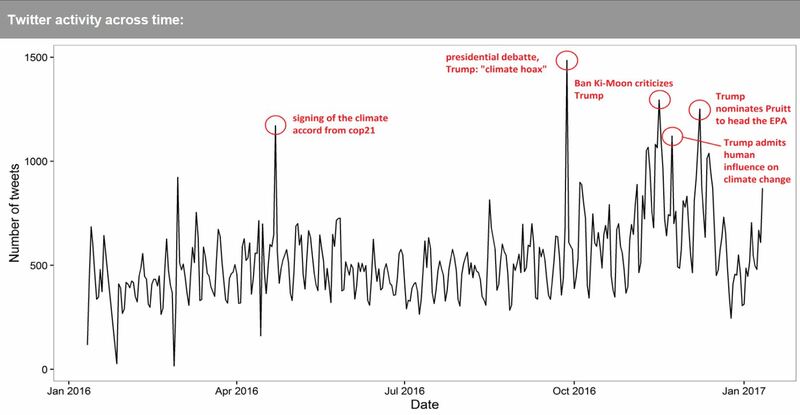 In comparison: The highest peak in 2017 had 2803 tweets per day, when Trump announced to leave the Paris Agreement; in 2016 his mention of a “climate hoax” in the presidential debate with Hillary Clinton triggered 1485 tweets that fit our criteria. Again, it was Trump who triggered another peak of attention for climate change, with his dismissive reaction to the fourth national climate assessment for the USA. Although the report warned that the US will face serious economic consequences of climate change, the American president just did not “believe it“. As in previous years, the UN climate summit was a major driver of Twitter dialogue about climate change. Its beginning on Dec. 3 resulted in the highest number of tweets in the two weeks of the summit. Unsurprisingly, the debate reached its low point on Dec. 25, when most Twitter users were likely too busy celebrating Christmas to tweet about climate change. We can sum up – in accordance with our colleagues from MeCCO, who are following the climate change debate in offline media – that Donald Trump is still a major driver of attention for climate change (although often in a negative way). In contrast to the previous year, however, he is not dominating the main events any more: Out of the five events triggering the most tweets, only one related to him directly. The other events are a combination of extreme weather events and scientific reports, linking the weather events to the greater picture of climate change. Thus, the voice of science seems to have become more prominent in the global Twitter debate. Regarding the domains that the tweets linked to, there were almost no changes compared to previous years. News outlets still dominate the ranking. Two of them are new in our top ten list: Vox, an American news and opinion website noted for its concept of explanatory journalism, and grist.org, an independent news outlet and network of innovators writing about climate, sustainability, and social justice. On rank 10, we find the personal blog of an Australian climate activist. 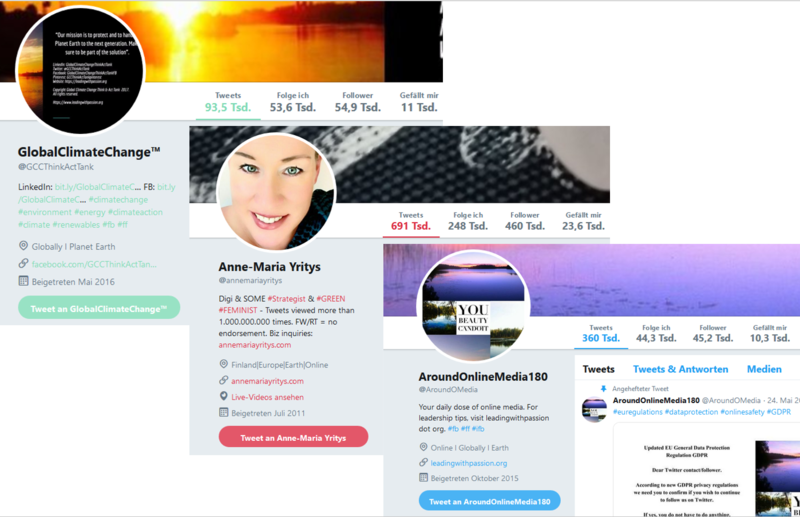 The three accounts contributing the most tweets in 2018 were “GlobalClimateChange” (@GCCThinkActTank) with 56,759 tweets in our sample, Anne-Maria Yritys (@annemariayritys) with 33,943 tweets and AroundOnlineMedia180 (@AroundOMedia) with 20,814 tweets. All three accounts belong to the same person – who self-declares herself as “Finland’s most followed business person on Twitter” and describes herself as “an active (online) networker and social media strategist” also interested in climate change and sustainability. As far as a Google search reveals, she seems to be a real person and not a bot – which would make her case a stunning example how single people can reach vast audiences via social media. The most retweeted tweets in 2018 were all sent by accounts that are extremely active, having sent more than 50,000 and up to 150,000 tweets. They contained either extreme right positions or an extremely positive stance towards climate activism – this is not a pattern specific for the topic of climate change, but extreme positions on Twitter in general trigger high numbers of retweets. To sum up, our retrospective gave some insights into general mechanisms of attention on Twitter – controversies and extreme positions fuel the debate – as well as explain attention for climate change on Twitter in 2018, which was mostly provoked by scientific and natural events, completed by political events. Method: Our Online Media Monitor provides ongoing monitoring of the transnational online media debate on climate change by searching for related tweets. Since January 2016, the OMM collects tweets if they contain the following hashtags or key words: #climatechange OR “climate change” OR “global warming” OR “Klimawandel”. Additional criteria are that the tweets got at least 5 retweets and contain at least one link. Is German Climate Coverage driven by extreme temperatures? Partly. Recent weeks have not only brought about record-breaking temperatures, but also a rise in climate coverage, as clearly shown by our Online Media Monitor (OMM) on Climate Change Coverage around the world . But are higher-than-usual temperatures really the main trigger of climate change reporting? We had a closer look at the case of Germany: climate change has recently spread from science sections onto front pages. Not only the leading intellectual weekly Die Zeit printed it on the first page; climate scientists also made headlines in the tabloid BILD, and the popular evening TV Show Anne Will raised the question of how we should act in the face of climate change. Going beyond these anecdotal observations of the last few weeks, we examined the correlation of maximum temperatures and climate change media coverage in Germany between the 2nd of August 2017 and the 6th of August 2018. The weather data stems from different weather stations in Germany, operated by the Deutscher Wetterdienst . For every day, the data from the station that measured the highest temperature was chosen. The temperature data were compared with the daily share of climate-relevant articles in three major German news outlets (Süddeutsche Zeitung, Spiegel Online, Tagesschau.de) . Figure 1 shows the percentage of climate change coverage in blue and the maximum temperature in red. The percentage of climate-relevant articles between August 2017 and August 2018 ranged from 0% on several dates to 7.4% on November 5th, 2017, with a mean of about 1.13%. First of all, this emphasizes that even in these leading news outlets, attention for one of the biggest challenges of our time is fairly limited. Secondly, the maximum in climate-change reporting was recorded in the winter – extreme summer heat, apparently, is not the most powerful driver of coverage. Thirdly, thresholds may play a role: while journalists seem to have enjoyed the warm spring and early summer and the absence of rain without intensifying their coverage of climate change, after weeks with temperatures frequently exceeding 30 degrees,  the issue of a problematic drought and heat wave could no longer be ignored. The heat: we examined the dates on which climate change-relevant articles exceeded 3.39% (twice the standard deviation). On these dates, the correlation between maximum daily temperatures and media coverage is considered to be statistically significant, i.e. linked to genuine effects or associations rather than random error or measurements in variation. Therefore, temperatures do play a role as triggers of coverage. But there are also other triggers. Other extreme weather events: the first date of interest is the 02.09.2017, with 5.1% of the total articles published on this date related to climate change. This date marks the occurrence of Hurricane Harvey and associated strong rainfalls. Hurricane Harvey likely triggered climate change reporting because climate models indicate that the general frequency and the rainfall rates of such events will possibly increase in the future . A similar but more protracted reaction can be observed on the 17th (4.4%) and 19th September 2017 (3.9%), shortly after the formation of Hurricane Maria. Politics: on the 4th of November 2017, 5.2% of the total articles published were climate change-related. This was linked to the preparations of the United Nations climate conference COP23 and anti-coal protests in Bonn. Climate change reporting remained high (4.5-7.4%) until the 18th of November 2017, encompassing reports about COP23 and general climate change coverage triggered by the international event. The One-Planet-Climate-Summit in Paris on December 12th 2017 caused a 3.9% climate change media coverage. UN Secretary General Guterres’ speech on December 31st 2017, issuing a ‘red alter’ for planet Earth while mentioning climate change as a major threat, caused another reporting peak of 4.5%. And again, the heat: on July 25th 2018, wildfires in Greece killed dozens of people, and resulted in 3.5% climate-change relevant articles. In Germany, temperatures already frequently exceeded 30°C at the beginning of June – considerably higher than the average June temperature of 15.7°C recorded between 1901 and 2015 . At the end of July, Germany experienced temperatures over 34°C (see green line in Figure 1). This lengthy heat wave led to a sustained period of more frequent climate-relevant media coverage, with peaks on 29.07.2018 (4.3%) and 03.08.2018 (6%), and over-average media coverage in between these dates. We can therefore infer that extreme temperatures and other weather events that are becoming more likely in times of climate change do trigger coverage, but political events like the UN climate summits still raise more short-term attention. Even with the current drought and heat wave, the problem of weather events is that their duration exceeds the attention span of media coverage, which is addicted to short-term events. Yet, journalists are not like frogs sitting in the pot that gradually heats until it boils. At some point, they started writing about climate change – let us hope that attention for this problem is sustained even after it is has cooled down. Posted on 29. August 2018 13. December 2018 Author Manuel KreutleCategories Home, Media Watch Blog, Online Media Monitor News2 Comments on Is German Climate Coverage driven by extreme temperatures? Partly. The paper “From “Knowledge Brokers” to Opinion Makers: How Physical Presence Affected Scientists’ Twitter Use During the COP21 Climate Change Conference” was published in the International Journal of Communication. This study investigates the 2015 United Nations Climate Change Conference summit and examines scientists’ social media use by analyzing “digital traces” that scientists left on social media during the summit. Using geolocated tweets, we compare the Twitter use of scientists who attended the conference with those who did not. Combining automated, quantitative, and qualitative content analysis, the study shows how scientists participating in the conference provided live reporting and formed a transnational network. Scientists at the conference and elsewhere engaged in political advocacy, indicating a shift toward a new pattern of hybrid science communication, which includes characteristics that have formerly been attributed to journalism and advocacy. The paper was published by Stefanie Walter, PhD, Fenja De Silva-Schmidt, M.A., and Prof. Dr. Michael Brüggemann. One Year of Climate Change on Twitter – One Year of Trump Arousing Attention? 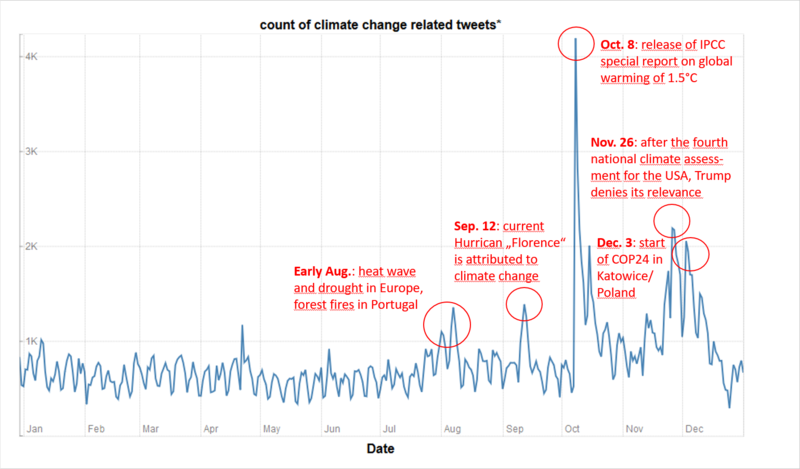 Review of Twitter communication on climate change in 2017: Which events triggered tweets about climate change and to which domains do these tweets link to? The analysis of our online media monitor (OMM) reveals that the number of climate change-related tweets has risen compared to 2016. Still – and this year even more – Donald Trump’s statements and action trigger most Twitter communication on climate change. This year’s highest peaks of attention were related to climate political events in the USA. Most tweets were published on 2nd June 2017, one day after US-president Donald Trump declared that the USA will quit Paris climate agreement. The second most discussed event was Trump’s order to review Obama’s clean power plan, in which he lifted the ban on coal leases and discarded expert thinking on true cost of carbon emissions. The third event triggering climate change related tweets was the inauguration of Donald Trump as US-president. In contrast, other political events like the climate summit in Bonn received only little attention. Besides events from the political sphere, also extreme weather events like Hurricane Harvey in August and Hurricane Irma in September triggered a huge amount of climate change-related tweets. One peak of Twitter communication in August 2017 was provoked by the release of a scientific report which concludes that Americans already feel the effects of climate change. This means that also scientific events have the potential to trigger debate, although in 2017 mainly political issues seem to have caused communication. Generally, it bears mentioning that almost exclusively US-American events received a lot of attention. 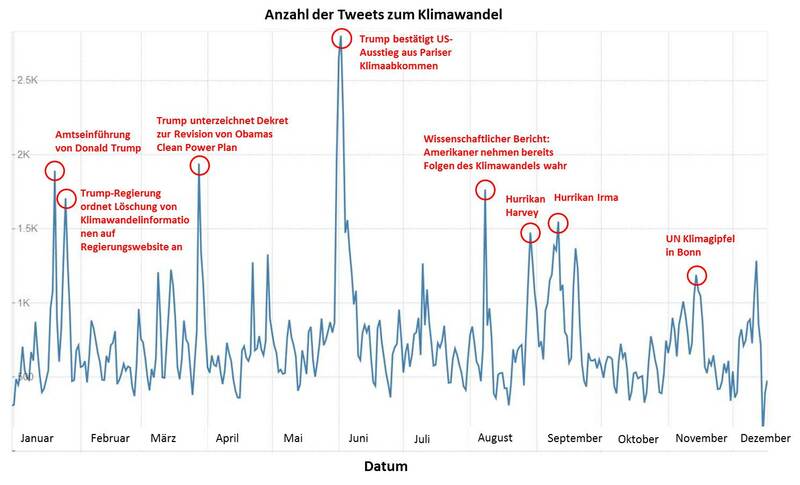 This is remarkable against the backdrop that the online media monitor does not only capture tweets with the hashtags or key words #climatechange or “climate change” or “global warming”, but also the German word “Klimawandel”. We also analysed the domains climate change-related tweets link to, i.e., which sources they use. A look to the Top 10 domains reveals that most tweets link to other tweets or other content published on Twitter, e.g. photos. Apart from that, journalistic news websites are the main source of reference. Especially the British newspaper “The Guardian” plays a leading role, followed by other rather liberal and progressive outlets like the “New York Times”, “The Independent” and “Washington Post”. Interestingly, conservative news outlets only appear in the Top 20 sources of reference, e.g. Breitbart. Not only classic journalistic outlets, but also innovative journalistic websites are among the Top 10 sources, e.g. “Inside Climate News” – a Pulitzer Prize-winning, non-profit, non-partisan news organization dedicated to covering climate change, energy and the environment, or “Thinkprogress”, an editorially independent news site of the Center for American Progress Action Fund. Interestingly, also the hybrid outlet “Climatecentral” belongs to the Top 10 sources of reference. It is edited by leading scientists as well as journalists researching and reporting facts about climate change and its impact on the public. Top 10 domains of the latest 365 days (state: 19 December 2017) that Tweets about climate change link to. Our online media monitor (OMM) provides ongoing monitoring of the transnational online media debate on climate change by searching for related tweets. For already two years, the OMM collects Tweets if they contain the following hashtags or key words: #climatechange OR “climate change” OR “global warming” OR “Klimawandel”. Additional criteria are that the tweets got at least 5 retweets and contain at least one link. Ein Jahr Klimawandel auf Twitter, ein Jahr Trump im Zentrum der Aufmerksamkeit? Jahresrückblick auf die Twitter-Kommunikation zum Klimawandel 2017: Welche Ereignisse traten Tweets zum Klimawandel los und auf welche Domains verlinken diese Tweets? Eine Analyse unseres Online Media Monitors (OMM) zeigt, dass die Zahl der Tweets zum Klimawandel im Vergleich zum Vorjahr gestiegen ist. Auch im Jahr 2017 entfachen Donald Trumps Äußerungen und Amtshandlungen größtenteils die Kommunikation. Die Jahres-Spitzenwerte korrelieren vor allem mit klimapolitischen Ereignissen in den USA. Die meisten Tweets wurden am 2. Juni 2017 abgesetzt, einen Tag, nachdem US-Präsident Donald Trump den Ausstieg aus dem Pariser Klima-Abkommen verkündete. Am zweithäufigsten wurde nach Trumps Dekret, Obamas „Clean Power Plan“ für saubere Energie zu überprüfen, getwittert. Damit kippte der neue Präsident das Verbot der Kohleförderung und strich Expertenaussagen zu den wahren Kosten der Kohle-Emissionen. Als dritter Auslöser klimabezogener Tweets sticht Donald Trumps Amtseinführung heraus. Andere politische Ereignisse wie beispielsweise der Bonner Klimagipfel erregten im Gegensatz dazu kaum Aufmerksamkeit. Neben politischen Ereignissen triggerten Extremwetterereignisse wie die Hurrikane Harvey und Irma im August und September viele Tweets. Ebenfalls im August provozierte die Veröffentlichung eines wissenschaftlichen Berichts eine Spitzenflut an Tweets. Die Studie zeigte, dass die Amerikaner bereits Auswirkungen des Klimawandels wahrnehmen. Dies verdeutlicht, dass wissenschaftliche Ergebnisse ebenfalls Twitterdebatten anstoßen können, wenngleich politische Ereignisse überwiegen. Insgesamt ist bemerkenswert, dass fast ausschließlich US-amerikanische Ereignisse Beachtung fanden. Dies ist vor allem interessant, wenn man berücksichtigt, dass der Online Media Monitor nicht nur Tweets mit den Hashtags „#climatechange“, „climate change” oder „global warming“ erfasst, sondern auch das deutsche Wort „Klimawandel“. Wir untersuchten zudem, auf welche Quellen bzw. Domains die Tweets zum Klimawandel verlinken. Ein Blick auf die Top-Ten-Domains zeigt, dass das Gros der Tweets auf andere Tweets verlinkt. Abgesehen hiervon dienen journalistische Nachrichten-Webseiten als Informationsquellen. Die britische Tageszeitung Guardian nimmt dabei eine Hauptrolle ein, gefolgt von weiteren liberalen und progressiven Zeitungen wie die New York Times, The Independent und Washington Post. Konservative Nachrichtenseiten wie zum Beispiel Breitbart schaffen es interessanterweise nur in die Top 20. Unter den zehn Topquellen finden sich nicht nur klassische journalistische Medien, sondern auch innovative Nachrichten-Webseiten. Darunter ist Inside Climate News, eine pulitzerpreisgekrönte, überparteiliche Non-Profit-Nachrichtenorganisation, die sich der Berichterstattung über Klimawandel, Energie und Umwelt widmet. Oder Thinkprogress, eine redaktionell unabhängige Nachrichtenseite des Center for American Progress Action Fund. 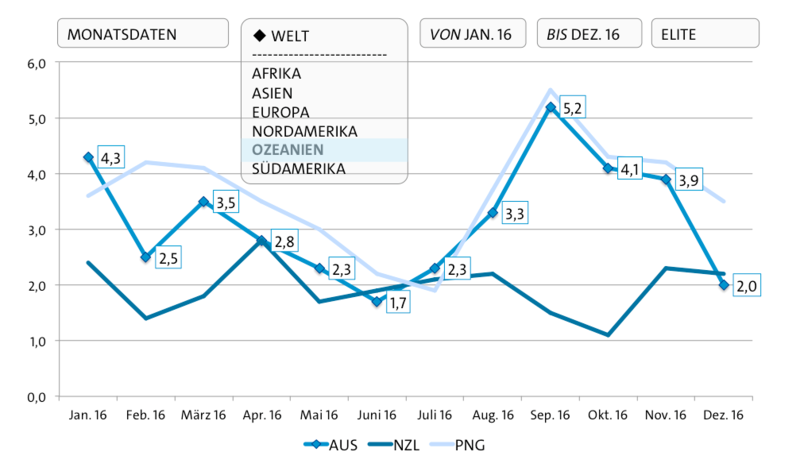 Auch Climatecentral zählt zu den zehn Topquellen. Sie wird sowohl von führenden Wissenschaftlern als auch Journalisten herausgegeben, die Fakten zum Klimawandel und seinen Folgen auf die Öffentlichkeit erforschen und berichten. Top-Ten-Domains der vergangenen 365 Tage, auf die Tweets zum Thema Klimawandel verlinken. Stand: 19. Dezember 2017. Unser Online Media Monitor (OMM) verfolgt laufend die länderübergreifende Diskussion über den Klimawandel in Onlinemedien. Seit fast zwei Jahren sammelt der OMM Tweets, die folgende Hashtags oder Stichworte enthalten: „#climatechange“ ODER „climate change“ ODER „global warming“ ODER „Klimawandel“. Weitere Kriterien sind, dass die Tweets mindestens 5 Retweets erhalten und wenigstens einen Link aufweisen. Our Online Media Monitor has been collecting tweets for roughly a year now – time for a little retrospection. The tool provides ongoing monitoring of the transnational online media debate on climate change by searching for related tweets. Tweets are collected if they contain the following hashtags or key words: #climatechange OR “climate change” OR “global warming” OR “Klimawandel”. Additional criteria are that the tweets got at least 5 retweets and contain at least one link. In 2016, we see a slight increase in the general Twitter activity related to climate change – but, even more interesting, also some prominent spikes in the debate. We did some research to find out about which issues the climate change debate revolved on the relevant dates. Four of the five events that sparked the most activity took place in the last quarter of 2016 and had to do with Donald Trump. 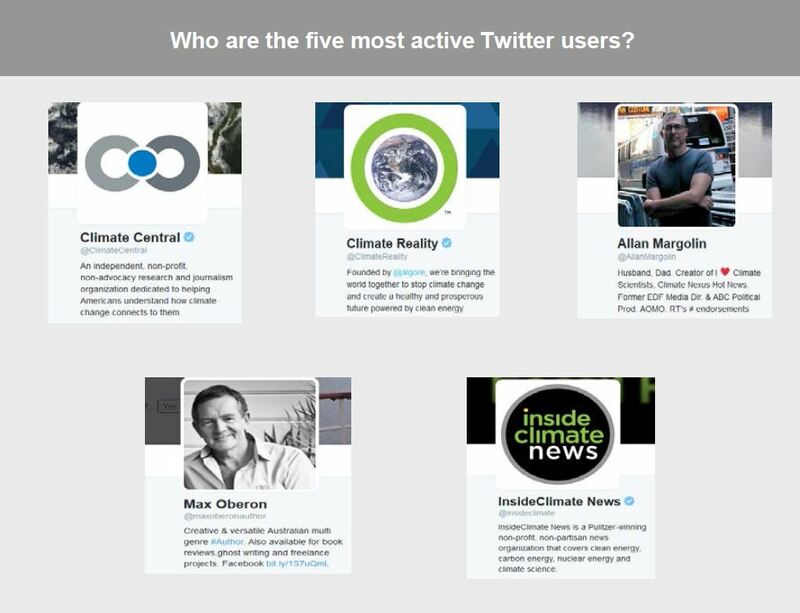 Among the five most active Twitter users in the climate change debate are three non-profit organizations and two private users (from Australia and the US). The most retweeted tweet was sent by BuzzFeed News, following the first US Presidential election debate. 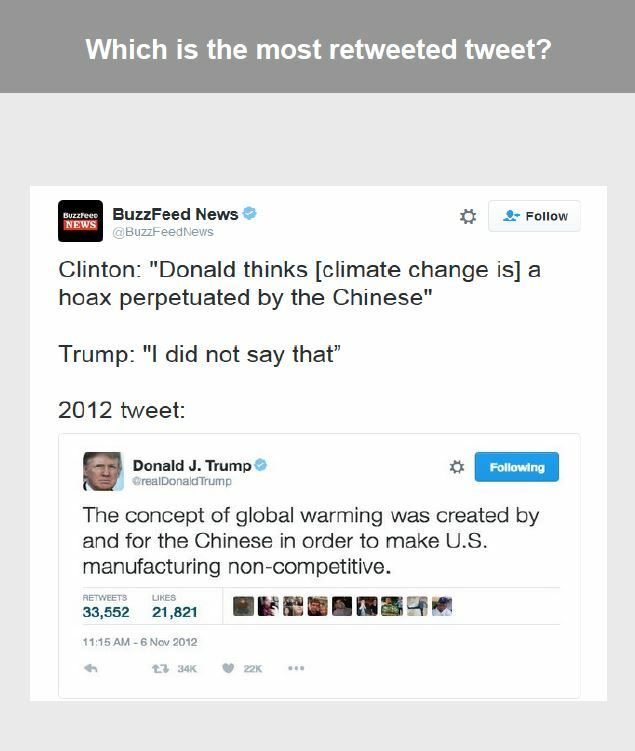 When Hillary Clinton accused Donald Trump of denying the existence of climate change and he rejected the statement, BuzzFeed cited Trump’s original tweet. To sum up, 2016 was the year when the climate change debate got increasingly connected to the new US President Donald Trump. By now, his name also ranks highly in Google’s search suggestions related to climate change. If and how the discussion will also center on Trump in 2017 is still to be seen – the OMM will monitor the debate as attentively as before. First part of the Online Media Monitor online! a tool which counts all tweets related to climate change on a daily base, lists the domains most linked to in context with climate change, and shows yesterday’s most retweeted climate change tweet. The Online Media Monitor will be composed of different modules. We are still working on the other modules, especially the tool for analyzing online news media. Since the official start of our CliSAP idea contest project in April, the CRG ‘Media Constructions of Climate Change’ has reached many important interim goals. 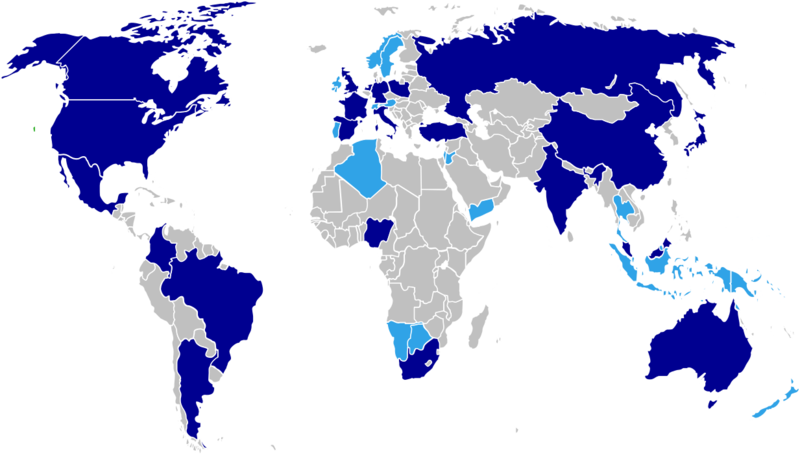 A sample of online news media was assembled, currently covering 23 countries worldwide. It includes well-known media outlets like the American and international edition of the New York Times (USA), but also titles such as Jakarta Globe (Indonesia), Excelsior (Mexico) or Svenska Dagbladet (Sweden) – in total there are currently 42 media outlets included. Important criteria for the selection of the media were (1) the coverage, (2) the daily publication and (3) the national / supra-regional importance of reporting. The media sample is supplemented by an analysis of the climate discourses on Twitter. Since July, ICDC has started the technical implementation of the tools. The online media monitor (OMM) is supposed to automatically store, analyze, aggregate, and visualize data obtained from global climate media reports, with results visible and usable for everyone. For this purpose, a program is currently being developed that extracts articles based on RSS feeds and exports them to a database. Afterwards, the implementation and visualization of the data analysis will be carried out. In the last phase of the project, automated content analysis functionality will be added to the tools in order to detect, for example, subjects or actors (such as countries, organizations, or particular scientists), and to visualize their activities. CliSAP researchers at CEN shall be provided with the opportunity for further analysis of the data from the media monitor.